The constitution of the archive has been built over time, with a systematic collection of materials. The catalog that may be accessed from this website has kept the unit in the archive. It maintains the organization in different documentary series, with the criterion of authorship in each type of document, and their functional nature. One of the most extensive sections is formed by the documentary series from the Societat del Gran Teatre del Liceu. It gathers all the legal documentation –minutes, statutes, documentation from assemblies, notarial documents, reglaments–, also the documents generated by the staff from the Societat –the “concierge”, or steward who lived in the building–, and a series of reports and projects for the improvement of the building. This set includes about 71 bound volumes, and several sheets of documentation. It has chronological continuity. From 19 July 1936 to February 1939, when the building became the Teatre Nacional de Catalunya for the disposal of the Republican Generalitat, some series were interrupted; the documentation kept being collected regularly, with different documentary criteria. Secondly, it is noteworthy the technical and artistic documentation, which is divided by type. It is contained in a set of 120 bundles, 60 reports and bound catalogs, 27 leaflets and 793 plans. The first includes studies, technical projects and plans, for renovations and reconstructions, which will be available as soon as they are digitized and cataloged. In the artistic section there are from photographs and photographic plates of scenographies –468 glass plates, 606 photographs, and 19 photographic negatives–, up to 78 sets and 20 scene plans. One of the most interesting collections is formed by the documentation about the artistic activity of the theatre during its history. It consists of 38 posters of different sizes and techniques, and about 502 bundles containing programs and libretti of operas, ballets, concerts and other events. Some of them are of high artistic quality, such as the programs of the Russian Ballets, the Association Música da Camera, apart from its historical interest. The administrative documentary series is one of the most extensive, still in working process. It gathers the different series that generated each one of the businessmen who ruled the theatre, consisting of a copy of the documentation, sometimes the original, with varied criteria according to each period. 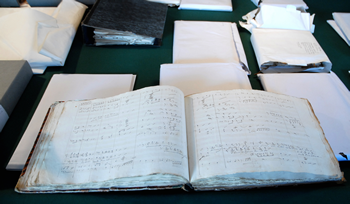 This collection consists of the Treasury Receipts –about 115 bundles and 2 books–, the Income Receipts –formed by 3 large bundles and 2 books–, the Ticket administration and shares –formed by a set of 40 bundles and 2 books–, and a set of varied documentation, in different formats, which includes from leases to account statements or recognition of debts, a total of 50 bundles and 14 books. The correspondence series show the division between the letters issued from the Societat, and the set of letters from the different businessmen. This collection, which is also in the process of study, covers 10 bound books and 39 bundles. One of the documentary series most valuable consists of sheet music, most of them from the 19th century. Some of them are handwritten, and belong to works commissioned by the Societat. The collection of dance pieces, composed for the Carnival dances, is unique. It is also noteworthy the collection of opera sheet music, copies of materials used for the performances, or presented to the contests organized by the Societat or by some of the businessmen. This documentation covers a volume of more than 96 filing boxes. An important part of the collection has been preserved thanks to the dedication of the various concierges, workers at the service of the Societat del Gran Teatre del Liceu. We have to thank them for it, Pius del Castillo, Bartomeu Carcassona, Francesc Carcassona i Salanova, Ricard Carcassona –grandfather, father and grandson–, Josep Burgas, Manuel Fages, Miquel Alañá, Pere Puértolas and Joan Antich. After the fire at the theatre in 1994, we have to thank Montserrat Figueras for her interest in recovering the documentation. Then the collection was inventoried by Enid Negrete and Isabel de Aramburu.